Page Rank is a scale Google uses to help determine the importance of a particular website. It’s measured from 0-10, with a Page Rank 10 being the highest. Page Rank is one of many factors that helps determine where your site lands in Google search results. In layman’s terms, your site’s Page Rank is an indication of your site’s “authority” or “popularity.” The higher your Page Rank, the better you rank. How Does Page Rank Affect Search Results? 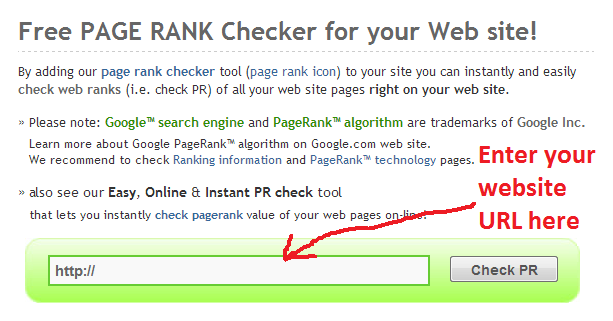 A quick way to check your site’s Page Rank (or PR) is to visit the free PRChecker tool. Simply enter your website URL (including http://) and click “Check PR”. You’ll need to enter a CAPTCHA, then click “Verify Now” to see your site’s Page Rank. 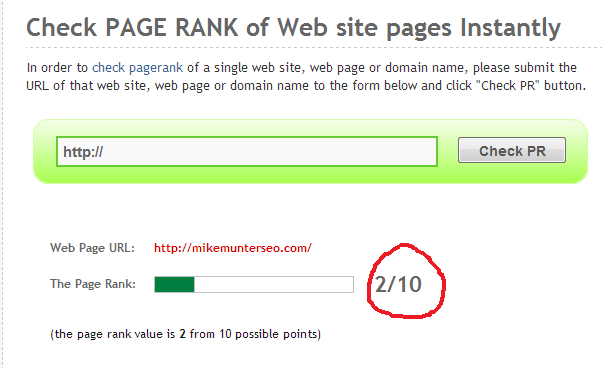 In the example above, you can see that my old SEO website has a Page Rank of 2. In general, this is a pretty low ranking. So, since my former site is a PR2 site, I would likely be outranked by sites in my industry that have a higher Page Rank. This isn’t the case everytime – there are lots of factors that go into Google’s search engine ranking algorithm – but it is an easy way to see how you stack up against your competitors. What you might consider doing is checking your site’s Page Rank and then compare it to your competitors to see how strong their site is. As you begin work strengthening your site, you can monitor it from time to time to see how you’re doing. A key way to improve Page Rank is get more links that point back to your site. The stronger the link coming back to your site, the more it can help you improve your page rank, and thus, improve your position in search results. Here’s a Hollywood example of how getting links from strong sites can help improve your website’s Page Rank. Let’s say I walk into a bar by myself. I’m probably not going to be that popular because I don’t have anyone with me. My Page Rank is 0. Now let’s say I walk into the bar with a local TV anchorman, who’s popularity is pretty decent. In Page Rank terms, he’s a PR 4. Just by the fact that I’m with this guy, more people might pay attention to me. My popularity is increased by hanging out with him. I’m no longer a PR0, maybe I’m now a PR2. Taking it a step futher, let’s say a month later, I walk into the bar with Brad Pitt. In terms of popularity, Brad Pitt might have a Page Rank of 9 or 10, so just by the fact that I’ve walked into the bar with him, my popularity soars and now I’m a Page Rank 6. Back in the real world, when you get links from sites whose PR is higher than yours, you stand a good chance to increase your own site’s authority. This is why getting a link from a reputable site like the Better Business Bureau or your local chamber of commerce is so important. 1. Make a donation. Sometimes a donation for as little as $50 or $100 back to your local college or alma mater can result in acknowledgement on their website. When your name or your business name is listed, make sure the link is in place back to your site. 2. Speaking engagement. If you have the opportunity to speak at a high school career day or address a college class with your business expertise, these are great ways to earn a link. Many colleges list their upcoming events schedule and this is where you would be listed along with a link back to your site. Page Rank is an important indicator of the importance of your website. The more quality links you get, the higher your page rank will become and the stronger your site will be. There are lots of ways to get quality links back to your website. If you’d like to find ways to strengthen your site’s PR, just give me a call.